NAVAIR leaders and employees joined three distinguished Hispanic professionals in a discussion of the impact of the growth of the Hispanic population in the U.S. last week. The impetus for this Oct. 4 discussion was to celebrate Hispanic Heritage Month across NAVAIR. The event, co-sponsored by NAVAIR’s Hispanic/Latino Engagement Action Team (HEAT) and NAVAIR’s Equal Employment Opportunity Office, was one of the ongoing programs provided to elicit conversation on diversity and inclusion. Response to the event was overwhelmingly positive with active engagement via video teleconferencing throughout the event. “This is the first time that we have tied in 23 sites for a national event like this,” said Gary Kessler, Naval Air Warfare Center Aircraft Division executive director and one of the three executive co-champions of HEAT. The event offered a unique opportunity for a national celebration when Rear Adm. Mathias Winter, commander, Naval Air Warfare Center Weapons Division, NAVAIR assistant commander for Test & Evaluation and co-champion of HEAT, set the stage by welcoming the national audience from Point Mugu, Calif. Winter echoed the message of Chief of Naval Operations Adm. Jonathan Greenert, citing the challenge faced by the Navy in recruiting, nurturing and motivating a relevant and diverse workforce that includes Hispanics. Describing “Latinos as the nation’s engine of population change,” Rogelio Saenz, dean of the college of Public Policy at University of Texas at San Antonio, highlighted the dramatic changes in the Latino population from 1980 to 2010. “In 1980, one of 16 people in the United States was Latino,” Saenz said. “Today, Latinos represent about one out of every six” with projections indicating that Latinos will represent about three out of 10 in the coming decades. 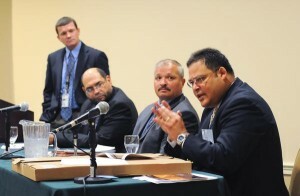 Continuing the theme of demographic shifts in the Hispanic population, David Vela, regional director, Southeast Region, National Park Service (NPS), talked about the need for federal agencies to stay relevant in a changing world. The panelists also praised NAVAIR for conducting inclusion training for supervisors, managers and team leads in the Research and Development and Test and Evaluation engineering communities that was occurring in the adjoining conference room. “We have to rely on line managers. They are the ones that hire and fire,” said Richard Arellano, executive support director, Industrial Operations and the Anti-Terrorism/Force Protection coordinator for Naval Shipyards for the Naval Sea Systems Command and chairman of the DoN’s Advisory Council on Hispanic Employment. Arellano encouraged leaders and hiring managers to ensure that the applicant pool provides candidates with a diverse mixture of skills and backgrounds – not just race and gender. As an example, Arellano shared how he hired a man who was a poetry major in college and a man with a strong analytical background. By recognizing the value of both skill sets, he created a more effective team. Garry Newton, Logistics and Industrial Operation deputy assistant commander, Fleet Readiness Centers director, and HEAT co-champion, offered closing remarks reinforcing the need to stay relevant with the changing demographics of NAVAIR’s potential applicant pool. Newton urged NAVAIR managers to not only focus on the diversity of NAVAIR’s workforce, but to also consider ways to increase retention and improve team dynamics through managing diversity. The NAVAIR workforce is invited to attend the next diversity program on Oct. 26 to discuss “Investing in Employees with Disabilities.” This two-part program will include assisting Wounded Warriors’ transition to the civilian workforce and the business case for hiring people with disabilities. The program will be live at the River’s Edge Catering and Conference Center at Patuxent River and via video teleconferencing at other sites. To register, contact your local Equal Employment Opportunity Office.